A jig saw is a devastatingly useful power tool. 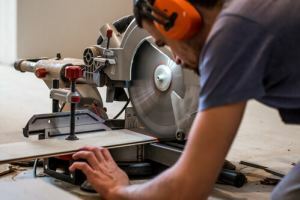 Where you’ll be strictly limited to straight cuts with your circular saw, there are plenty of occasions when you’ll want to make curved cuts and a jig saw is the only effective power tool at your disposal. If you don’t have the patience for a handheld coping saw and you want to get those curves cut with speed and precision, the best jig saw is crucial. 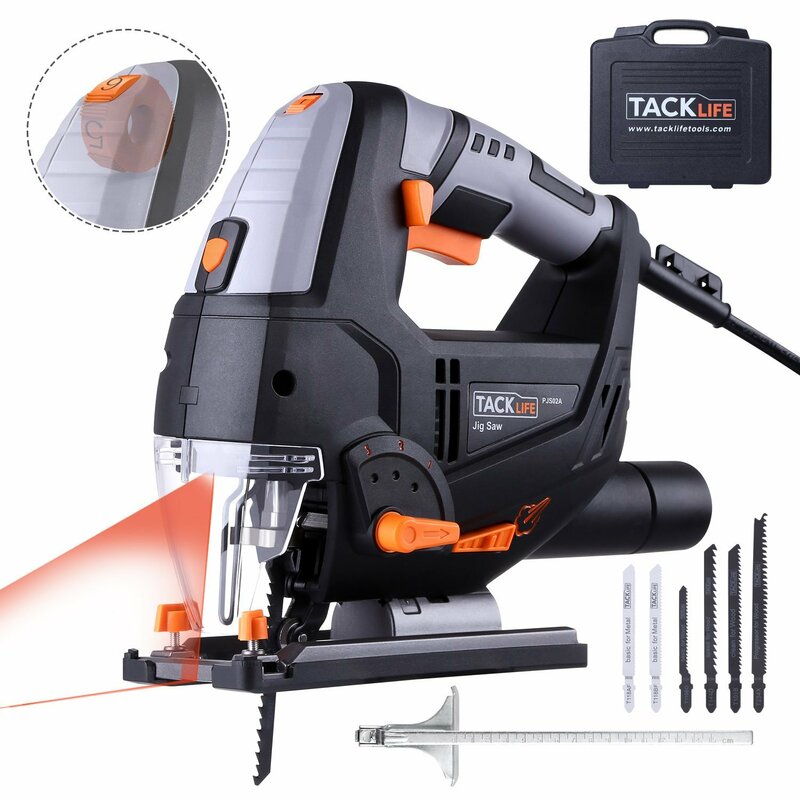 In today’s Tacklife laser jig saw review, we’ll look at an extremely cost-effective little jig saw that’s ideal for the home DIY enthusiast or the hobbyist woodworker. 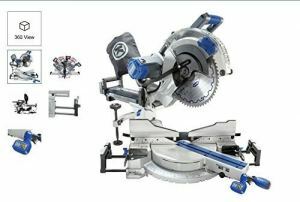 This jig saw performs as well or better than many that are more expensive. Really powerful, feature-full and solid performance. I will say this though – get better blades than what comes with it. This is pretty normal for most power tools though. I replaced these with Bosch blades and I can’t imagine anything about it being any better. 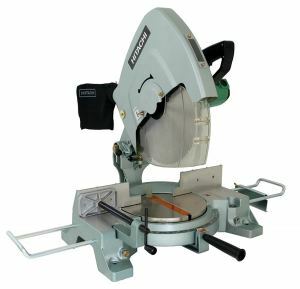 Although this is marketed as professional jig saw, we’d suggest that it’s a far better tool for the home woodworking enthusiast and DIY-er. It will certainly serve a turn on the job site but, if you’ll be hammering the saw all day and every day, there are stronger options you should pursue. That said, there’s very little we can do but praise the Tacklife, kicking off with the extremely nimble and powerful 6.7-amp motor. The copper construction brings down the amount of heat kicked off ensuring your jig saw will last longer without any dip in performance. You can fine-tune the cutting speed further using the variable speeds giving you a range of 800 RPM up to 3000 RPM where the Tacklife maxes out. 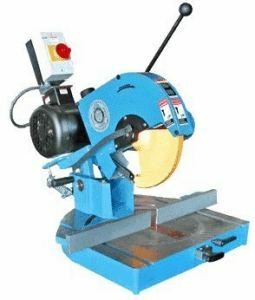 This ability to cut curves at varying speeds in a broad spread of materials makes the jig saw a wonderfully versatile addition to your workshop. If you tire of holding a trigger in place as you work, there’s a switch to lock the speed in so you can focus on the job at hand without feeling your fingers all clawed up. It’s not just raw power and flexibility you’ll get, though. 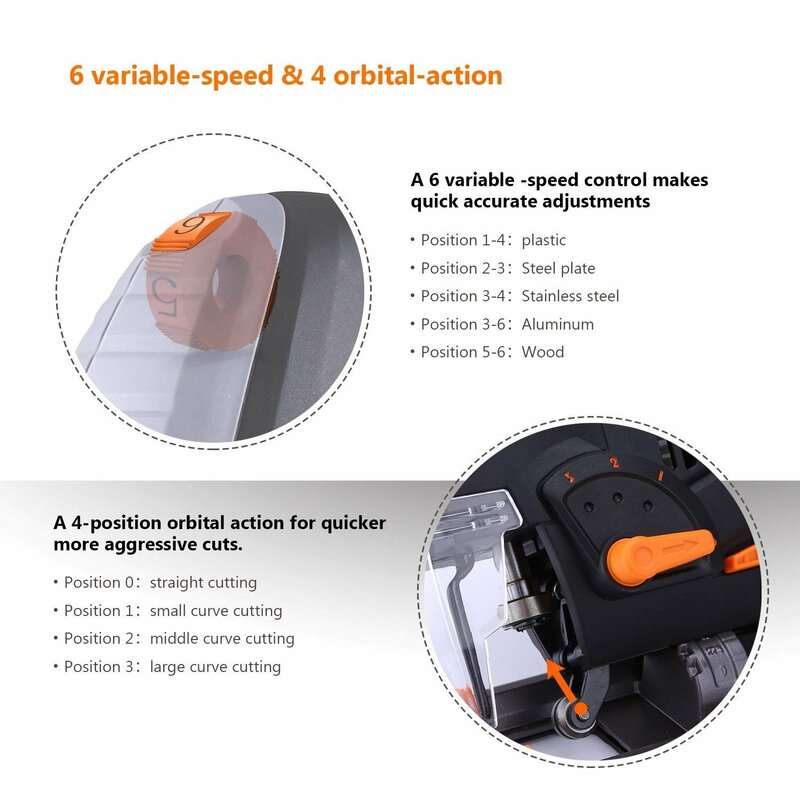 Surprisingly for a budget jig saw, you’ll get a neat laser guide so your cutting line is clearly demarcated guaranteeing precision as well as pace. This is especially valuable if you plan to do a lot of work in dull areas with inadequate lighting which, let’s face it, often seems to be the case when you’re working on a DIY project or home refurb. As well as making a full array of straight, curved and diagonal cuts in wood or plastic, gypsum and a variety of metals, you can also bevel 45 degrees in either direction with the adjustable shoe increasing stability as you happily slice away. Tacklife include 6 blades in the package further bolstering already excellent value. Swapping these out is child’s play with no extra tools required. Keyless changing saves you a great deal of time and effort while you can stash your spare blades in the on-board tool storage compartment, perfect if you’re rather absent-minded. 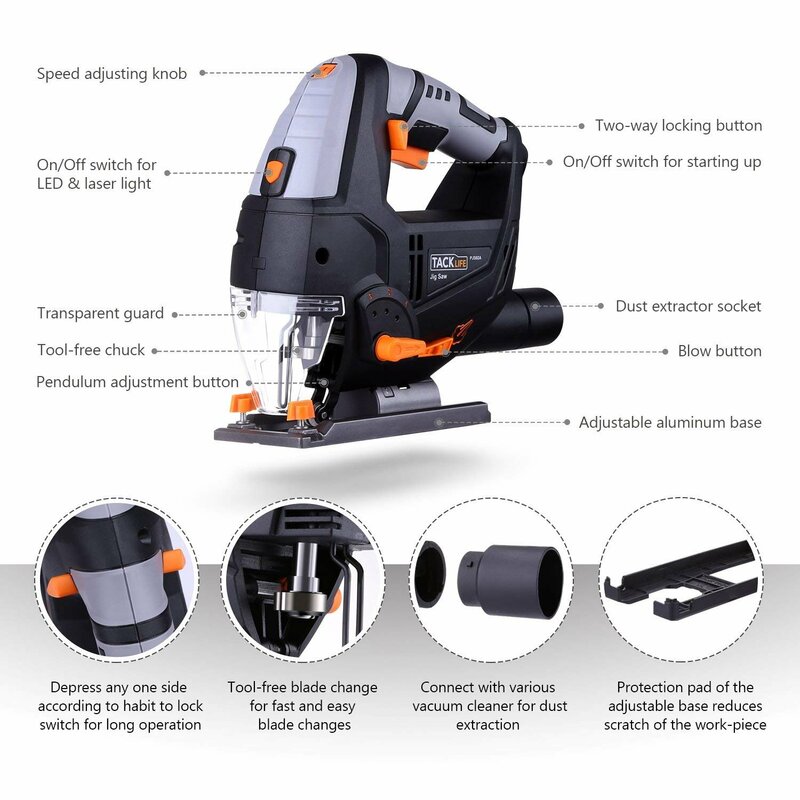 Corded power tools invariably deliver more power but this often comes at the cost of an inexcusably short and restrictive cable. Measuring up at just under 10 feet, the Tacklife won’t leave you feeling constrained. User comfort is at a premium with the Tacklife. The aluminum base is rugged and stands up to plenty of punishment while the non-slip handle means you can work at speed without worrying about your jig saw tumbling from your grasp. This is particularly useful when you’re working on small, intricate cuts. The saw tips the scales at less than 8 pounds so you can beaver away for lengthy spells with no chance of feeling any strain. As if all this wasn’t enough, you’ll even get a hard carrying case chucked in so you can carry your Tacklife jig saw from home to work without inflicting any damage. 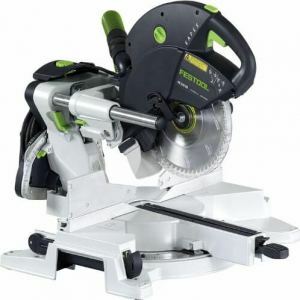 Not everyone wants or needs a hard-hitting best like Festool’s jig saw and if you’re a casual woodworker or enjoy taking care of some basic DIY, this 6.7-amp Tacklife is a fantastic budget saw that won’t run you much more than the price of a restaurant meal. Don’t be mistaken into thinking the low price tag translates to poor quality, though. From the copper-housed variable-speed motor packing a serious punch through the 4 orbital settings and general ease of use, the Tacklife is tailor-made if you have champagne tastes but beer money. With a fantastic 2-year limited warranty to ice the cake, there’s no reason not to add the Tacklife to your toolkit if you’re looking for an adaptable and extremely functional jig saw at a price you’ll love. 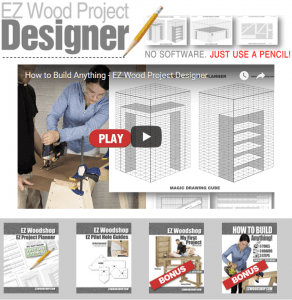 Check one out today and start working with a wide spread of materials tomorrow.